The first “digital-first” approach for principles of economics courses. 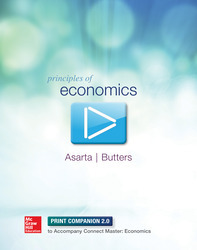 Connect Master: Economics offers the same core content covered in mainstream textbooks, but breaks free from the constraints. Instructors are empowered to take advantage of new approaches in teaching methodology to revitalize their courses. Students connect concepts to application in over 250 topics- each anchored by an engaging 2-4 minute high-quality video and a suite of learning resources.